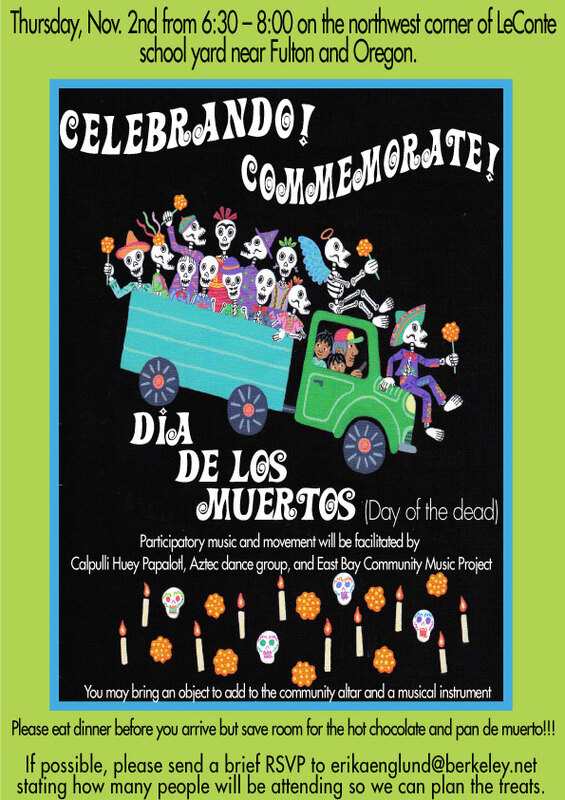 Commemorate Dia de Los Muertos (Day of the Dead) with an all-ages gathering hosted by EBCMP and the LeConte School PTA. Join us for this outdoor event on Thursday, November 2nd from 6:30-8:00 pm on the the northwest corner of the LeConte school yard near Fulton and Oregon. Participatory music and movement will be facilitated by Calpulli Huey Papalotl, Aztec dance group, and East Bay Community Music Project. You may bring an object to add to the community altar and your instrument. Please eat dinner before you arrive but save room for the hot chocolate and sweet bread that will be served. If possible, please send a brief RSVP to erikaenglund@berkeley.net stating how many people will be attending so we plan the treats. Bring an object to add to the community altar, and your instrument, if you like.